+An Open Letter to Howard Schultz by Jon Lovett of Crooked Media/Pod Save America/Lovett or Leave It. Unless you are a third-party (and not insane) conservative, stay out of the 2020 race. We don’t need you jacking up the election. +Any time Ted Cruz gets taken down a notch is a good day in my book. From what I understand Senator Bennett is usually mild-mannered so him going off on Ted is pretty spectacular! +I’m glad to see so many women announcing exploratory runs for president but the only two that I see so far having a chance are Senator’s Warren and Harris. And to be honest, I think Warren serves best in the Senate and I’m increasingly interested in Kamala Harris. However, I’m holding out for a Biden/Beto ticket. I’m interested to see where we are in a few months with more people joining in. I hope Kirsten Gillibrand bows out soon, though. Loving the new Wild East campaign by the Appalachian Trail Conservancy! We also just received the latest Journeys magazine for ATC members and it has a lot of great information on the campaign. I’m glad to see it because sometimes it feels like wild places that aren’t “out west” get left out of the conversation. 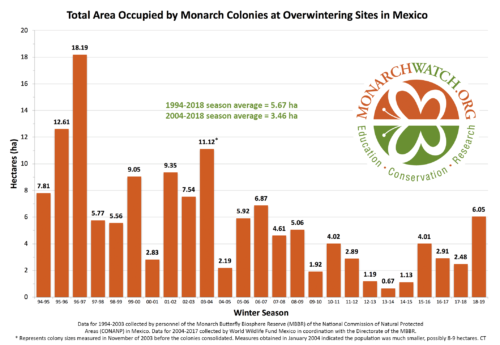 “World Wildlife Fund Mexico in collaboration with CONANP and the Monarch Butterfly Biosphere Reserve (MBBR) announced the total forest area occupied by overwintering monarch colonies today. Fourteen (14) colonies were located this winter season with a total area of 6.05 hectares, a 144% increase from the previous season.”–the monarch butterfly world is very excited about this news! Monarch season is around the corner for us! Other than starting tomato seeds earlier in the month, I’ve not been doing a whole lot. I had Chris get mulch twice this month so I could finish mulching the flower garden and we now have some left over for the edible garden but because of the clogged pipe issue in the front yard and a lot of rain recently, it has stayed super soggy out there. Just today at lunch I moved what was left in the back of his truck to a tarp just outside of the edible garden and we will likely move it by buckets next week because it is so soggy at the entrance that moving it with a wheelbarrow is causing rutting. The harvest in the garden is coming along with a lot of greens right now. The bok choy is mostly bolted but everything else is thriving. I’m concerned about the chives, though, I think they may finally die out from wet feet after putting up with it for so many years. We’ll see. Maybe they will come back like they usually do. Chris sowed sugar snap peas, onions, and lettuce earlier in the month/end of December and we have one bed left open that I’m not sure if it will get planted with a cool season crop or end up with tomatoes. Considering that it is February tomorrow and our February is looking to be jam packed, my bet is on tomatoes. The flower garden looks good at the moment despite dormancy for most everything. I’ve moved a couple of plants around, particularly the Argentine senna (Senna corymbosa) which we had placed in its original spot when other plants weren’t in the way and after some discussion and grumpiness between us with differing opinions, I moved it to the place where the almond verbena has been. It should come back, I’ve scratched a bit of the bark and it was still green, so crossing fingers, it will be a good fit for the location. I also moved the black and blue salvia (Salvia guaranitica) in ‘my’ bed from the edge of the bed to the back. We had three plants and I separated them out and now they will line along the back of the bed—probably to compete eventually with the passionvine that will swallow it whole sometime in August. I have a bag of stratifying seeds in the fridge I need to sow at some point. +This mural the Sunshine State Seekers painted of a section of the Florida Trail in their house! I just gave my book report the other day but I’m currently reading Thirst: 2600 Miles to Home by Heather ‘Anish’ Anderson, Alone on the Wall by Alex Honnold, and How to Talk so Little Kids Will Listen by Joanna Faber and Julie King. The first I just received this week after ordering it when Anish posted she was selling signed copies of her new book about her FKT of the PCT in 2013. I have a super strong suspicion that she is going to attempt an FKT on the FT this year—this is just my hunch based on a few cryptic things she’s posted, her current location being in Florida, and the fact that the return address on the book I received was from a well-known hiker friend of hers. Like I said, just a hunch, I could be wrong, but I’d be happy to see it. The second is an audio book about Honnold’s free solo climbing experiences and a bit of a history of the sport of climbing. I’m only about 14% into the audiobook but am enjoying it. If you aren’t familiar with Honnold he is the first person to free solo El Capitan in Yosemite. There’s a movie about it that I’d love to see at some point. And the final is a book I’ve heard talked a lot about in parenting circles and I finally got a copy of it from the library. I may need to buy it or scan certain sections so I can remember some key points. 4 year olds are hard, y’all. Not really anything. I bought a bench for my keyboard so I could start playing and work on my 39 Things for 2019 list and I’ve been somewhat diligent about trying to play. I need to remember to sit down there more. I have done a lot of watching now that tv shows are back on. The Big Bang Theory, This is Us, and Grey’s Anatomy are the standard fare with Outlander just finishing up it’s 4th season (way too short considering how much content was cut or changed from the book), and Victoria just started up again. I just saw a trailer the other day for The Spanish Princess about Catherine of Aragon, Henry VIII’s first wife. It’s based on the Phillipa Gregory novel and I’m very intrigued by it. Not sure when the debut date is. A few movies I’ve enjoyed on Netflix lately: Blue Jay, Our Souls at Night, Before We Go. I’ve also gotten into Grace and Frankie over the last week after several people told me how good it was and they were right! I’ve also watched two random Downton Abbey episodes because they were recorded on our DVR and it reminded me how good that show was. I may have to break out my DVDs for a rewatch at some point. Podcast episodes that I’ve loved lately aren’t coming to mind so I’ll leave it at this! I am Kyle’s (aka Mayor) Dad, thanks for the loving shout-out and link-back. 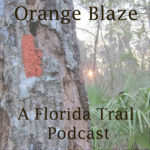 Not sure if you had the chance to explore Kyle’s website further than just Florida Trail day 25. Kyle has hiked the AT, PCT, part of the CDT and as you know currently doing the FT with his now blind dog Katana (aka Catfox). Also, he is restarted the trail after a week when his hiking buddy Dillon Sexton (aka Schweppes) decided to join the hike. Kyle catalogs his hiking with a daily blog, including numerous photos, and eventually follows-up with an Amazon book and Kindle version that furthers details the more interesting parts of the journey. Most people that have commented about the blog and books just adore his dog Katana, who is now completely blind from glaucoma and spends a very large portion of the hike on Kyle’s shoulders.